RIVERA Primo's HedLED range of headlights combines a high end halogen headlight with built-in LEDs for use as either turn signals (if legal) or running lights. The HedLED range includes the chromed aluminum Mighty Magnum, a 9in long bullet style light with a built-in visor over the 53⁄4in diameter headlight. It features a H4 halogen bulb (60/55w) with a three-bar clear lens and Rivera Primo's proprietary LED ring for running lights or turn signals. The Magnum line continues with the Mini Magnum, which is 7in long and has an external bezel, H4 halogen bulb (60/55w), Tri Bar, clear lens and LED ring for running lights or turn signals. 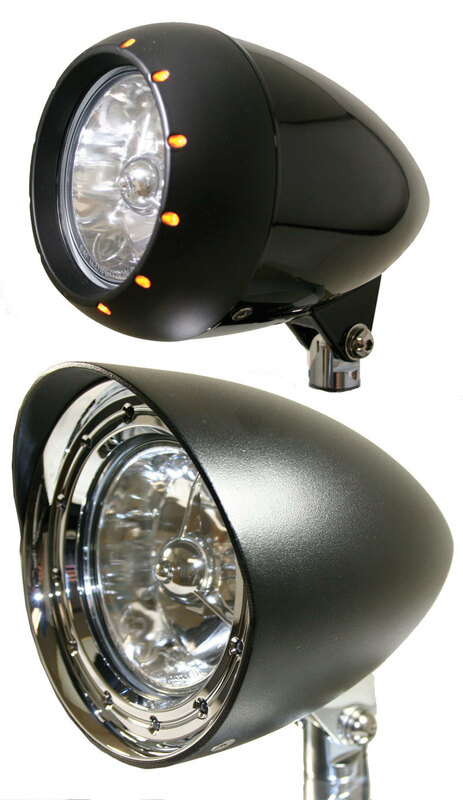 For those who do not want a chromed Magnum headlight the company offers both the Mighty Magnum and Mini Magnum in a matt black finish. Rivera Primo's Flamethrower Max uses the same chrome body and halogen light as the Mighty Magnum, but also incorporates an amber halo into the halogen. The high-intensity 'halo' can be kept on at all times as a running light. The RFB HID from Rivera Primo is a HID (high intensity discharge) headlight, with all of the necessary electronics built into the housing. It has all the advantages of the Mighty and Mini Magnums, plus the brightness of an HID, with the LEDs placed in the billet headlight bezel. The Alien Black is a variation of the RFB HID headlight, which uses a halogen bulb rather than an HID. Its bezel is powder coated in matt black, while the body is powder coated gloss black. As with all the company's HedLED lighting systems, it has the signature split ring or super bright amber LEDs that can be used as turn signals or running lights.